Antimicrobial activity of curry leaf is known to everyone and even Bactrim is also a known antibiotic. 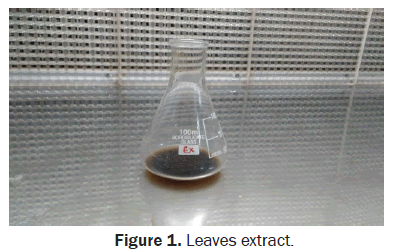 In this study it has shown that the antimicrobial activity of natural extract is showing the same activity as the Bactrim alone shown by graphically along with the images and explained the importance of natural resources. Increasing in the population there was a increase in the pollution along with that increase in the infections, it puts the work to the scientists to discover the antibiotics to cure the infections which was called Antimicrobial activity of the compound [1-3]. In this nature there are two types of compounds which shows the antimicrobial activity they are chemical and natural. Trimethoprim/ Sulfamethoxazole are the Bactrim chemical names, Bactrim is the know antibiotic for all the types of bacteria, know it was not at all using because of its high side effects [4-7]. Murraya Koeinigii which is commonly known as the curry leaf plant and it was commonly used in all the curry and some other food items preparation in India for its aroma, it was high useful in the medicine, rich in vitamin A & E, useful for the hair growth and having some antimicrobial activity also [8-10]. The main aim of this study is to get the comparison and combination studies of antimicrobial activity of both chemical and natural compounds and to show the importance of natural resources. Curry leaves extract, Bactrim solution, Nutrient agar Media, Water sample, conical flasks, Petriplates, beakers, spreaders, Motor and Pistil . • Before the setup of the experiment all the required equipment’s are sterilized completely (Figure 1). • Nutrient agar media was prepared and poured into the petriplates, plates were prepared and kept a side before the preparation of extract and the sample. • Curry leaves were taken and washed thoroughly. • Using the motor and pistil extract was taken by grinding manually and in the between distill water was used to get more extract. All the process was done in the laminar hood using the sterellized manner. • 890 mg of Bactrim was dissolved in the 5 ml of distilled water. • Normal tap water was taken as a sample to test the extract and compound. • Using spread plate method samples were inoculated on the nutrient agar plates. • After inoculation plates were kept for the 24 h incubation. Below Table 1 is the composition and arrangements of the plates to check the antimicrobial activity of the compounds. 100 μl of inoculum was taken in each plate to check the activity. In each duplicates were kept to estimate the better results. Table 1.Composition and arrangements of the plates. 1. After inoculation the plates were kept for the 24 h incubation and after the 24 h incubation (Table 2). Table 2. Result after inoculation. 2. Control plate was normal without any colonies it shown that sterilization was good (Figure 2). 3. 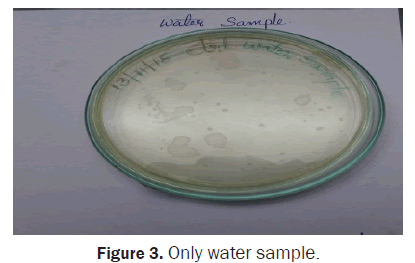 Water sample inoculated plate got 28 colonies which has shown that it is having contamination (Figure 3). Figure 3: Only water sample. 4. 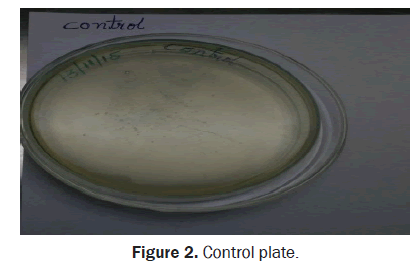 Sample and extract plate has sown the three colonies and it shown that extract has shown some antimicrobial effect (Figure 4). Figure 4: Sample and extract. 5. Bactrim and sample combination shown the 1 colony as we already know the antimicrobial effect of the compound (Figure 5). Figure 5: Sample and bactrim. 6. 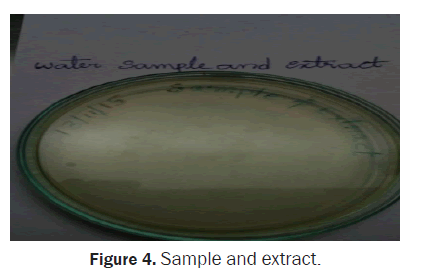 The final one the combination of both extract and Bactrim with sample has shown the 1 colony it has shown better result than extract and same as Bactrim (Figure 6). Figure 6: Sample, bactrim and extract. As the antimicrobial activity of the both natural and artificial compound was known, and The results also shown that the combination of extract and the Bactrim has shown the same antimicrobial activity as like the only Bactrim result [11-15], here the thing is not whether the compound has shown any effect on natural compound, but the main purpose is to show and make the readers to understand that the natural compound alone is showing a equal activity as like the artificial, so why we have to run and spend for the artificial things until and unless if it is a serious situation. Try to give the priority to use the natural sources more than the artificial or chemical (Figure 7). Figure 7: Graphical representation of number of colonies in each type of plates. Henry and Trime. A hand-book to the flora of Ceylon. Dulau & Co., London; 1893. Arulselvan P, et al. Anti-diabetic effect of Murraya koenigii leaves on streptozotocin induced diabetic rats. Pharmazie. 2006;61:874–877. Estee Torok, et al. Oxford Handbook of Infectious Diseases and Microbiology. OUP Oxford, UK;2009. Brumfitt W and Hamilton-Miller JM. Reassessment of the rationale for the combinations of sulphonamides with diaminopyrimidines. Journal of Chemotherapy. 1993;5:465–469. Anonymous. Co-trimoxazole use restricted. Drug Ther Bull. 1995;33:92-93. Arulselvan P and Subramanian SP. Beneficial effects of Murraya koenigii leaves on antioxidant defense system and ultra-structural changes of pancreatic beta-cells in experimental diabetes in rats. Chem Biol Interact. 2007;165:155–164. Jain Vandana, et al. Murraya Koenigii: An updated review. International Journal of Ayurvedic and Herbal Medicine. 2012;2:607-627. Syam Suvitha, et al. The growth suppressing effects of girinimbine on Hepg2 involve induction of apoptosis and cell cycle arrest. Molecules. 2011;16:7155-7170. Co-trimoxazole. The American Society of Health-System Pharmacists. 2015. Hamilton and Richart. Tarascon pocket pharmacopoeia 2015 deluxe lab-coat edition. Jones & Bartlett Learning, USA; 2015. Falagas ME, Grammatikos AP, Michalopoulos A. Potential of old-generation antibiotics to address current need for new antibiotics. Expert Rev Anti Infect Ther. 2008;6:593–600.